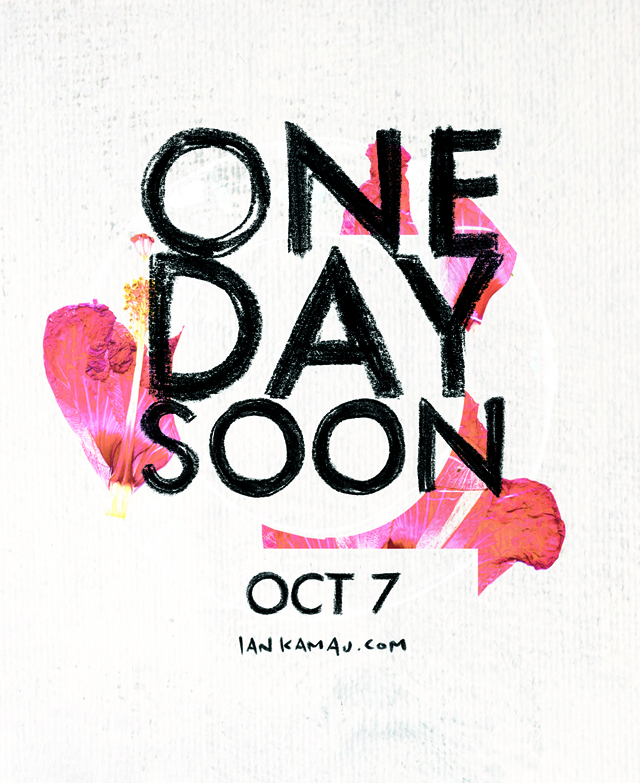 Over the last three years I have been obsessed with the album I’m about I’m about to release on Oct 7th entitled ‘One Day Soon‘. Since I graduated from my university with an honours degree in fine arts and design this an album has been on my mind and after two trips to Cuba for the Cuban Hip Hop Symposium and moving on from my design practice to do community work full time it was solidified that I would at least attempt to create an album. Even though I have released 2 EP’s (First EP 2003 & Cocoons EP 2011), 5 Podcasts and 3 Mixtapes to date technically I have never released an full length LP. I’m never really happy with what I create, maybe it’s because I’m a Virgo with perfectionist tendencies, maybe because in the process of making something you learn better how to do it and come out on the other end with more knowledge then when you started. My friend Kheaven told me once that he looks at his old music as baby pictures, though you are not always proud of it and may even be slightly embarrassed by it at times it was you at that time. This is the reason why all of the mixtapes that I released are an assortment of pictures of me as a baby and the reason why the podcasts were called ‘sketches’ because it was me at that time, unpolished, unfinished, still developing. I expect that process of developing will continue. I have been bored by hip hop at a certain points in my life. Boredom with hip hop was what compelled me to start going to poetry shows ten years ago to focus on the craft of putting words together. It was the same boredom that got me expand my sonic world in the years before recording One Day Soon. While making One Day Soon I was listening to more Bjork and Radiohead then The Roots or Common. I opened myself up to Little Dragon and Jose Gonzalez, recently I’ve been really into James Blake (just when to his show in Toronto.. amazing). I visited Brazil and was taken record shopping by another artist named Kamau in Sao Paulo, and experienced a whole other musical culture and group of artists including getting more and more into Milton Nasciamento. While recording I watched the Ken Burns Jazz series over and over and over again and although I can’t say that the album sounds at all like Jazz it was influenced by the people and the history in that series of documentaries. I only recently started listening to hip hop again as some of the younger guys like Drake and Kendrick Lamar and even Lil’ Wayne have brought a different energy into the hip hop world. I recorded my last mixtape (Love & Other Struggles) after I recorded One Day Soon and although the influences on the record are the comparable to One Day Soon, One Day Soon is a different experience. I think people will hear that difference and it might take them a moment to adjust. I remember Wynton Marsalis saying “with great art, you have to go to it. It doesn’t come to you. Shakespeare,” he said, “doesn’t come to you. You have to go to him.” I don’t completely agree with this statement, I think like a conversation art is a dance between two or more participants and should never be one sided, but I do understand what he’s saying; sometimes what we are comfortable with is only what we already know, but sometimes we have to challenge ourselves to step out of our comfort zone when experiencing something new. While recording the album I wasn’t hearing rhythm as much as I was hearing melody, I was interested in pushing my production beyond where it had been. I remember my friend Gavin Sheppard (of The Remix Project & Honest Music) saying to me years ago “people don’t listen to your music for the production.” That comment, though not meant as a negative, stuck with me to this day. It is always a challenge for me to make something better than what came before. I feel like I’m always fighting myself even when people say it is ‘good.’ I want to be great; I’m not there yet, I’m pushing at it though. I’ve learned so much in the process of making this album, it has not come easy. I don’t think that I am naturally talented in music. I do have a natural drive towards creating music and an ear for it but not sure if it is natural (along with poetry, visual arts and design) so I have struggled to learn and forced myself to try and be better; the production on One Day Soon as compared to my last self-produced record (The First EP) hopefully is a testament to that. I’m trying to improve. I say all this to say that One Day Soon is different then my past musical efforts, not drastically but definitely different. I did exactly what I wanted to do with this record without thinking about what people would like or not like. I think it is extremely important as a communicator or storyteller to be aware of the needs/wants of your audience, but most of the time during the recording process of this album (which took place mostly by myself in my apartment in Esplanade in downtown Toronto) I was thinking about where I would go, not what people (or radio or press or other artists) would like. People who listened and liked Love & Other Struggles will notice the difference, from a more hip hop influence to.. well.. you’ll have to decide..